With the possibility to connect the above mentioned sensors, the iMod telemetry module is a perfect solution for weather conditions monitoring. Built-in GPRS or 3G modem and telecommunications infrastructure enable a system supervisor to access information on weather conditions from any place. The iMod industrial computer provides constant Internet connection with the use of a GSM module and a LAN. This function offers unlimited access to information from the sensors to selected users. You can visualize data with a Web-browser with the use of internal database or via built-in NX Dynamics graphic interface. The iModCloud service was designed to manage several stations located on a large area. It allows to view operation parameters of many iMod devices in one place. All devices are connected by safe VPNs. This allows easy management and adjusting to your needs. iModCloud provides access to all your iMod devices with any Web-browser - also on mobile devices. With the use of several iMod devices you can create a whole weather monitoring network on a large area - the iModCloud service allows an easy access to all your devices. The iMod platform can send SMS messages to a large group of recipients (e.g. about a long drought). This enables early prevention of the effects of sudden changes in weather conditions. It is especially useful in agricultural areas, where early information on weather conditions can protect against loss of crops. In the cities it provides early warning system, this enables efficient evacuation of the areas at risk (e.g. earthquake risk). The iMod telemetry module is equipped in an internal memory card and it can support SD cards (up to 2 GB). This allows frequent saving of the weather information and archiving a huge amount of data. The files can be saved as CSV files (it makes it easier to export files to office applications) or saved to SQL data bases - both in the device and on external servers. This allows to collect data and further analysis. 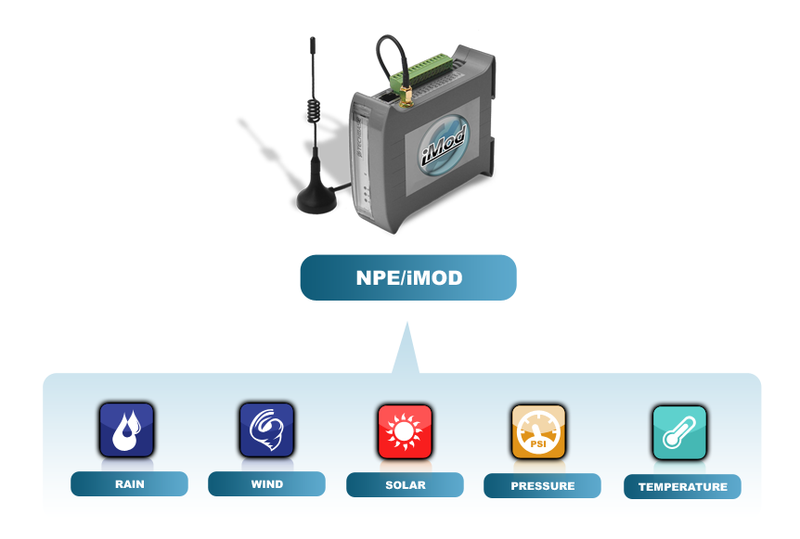 Due to constant Internet connection - with the use of a 3G modem or a LAN - the iMod industrial computer can transfer data from weather stations to national information services. You can view current weather information from any place.